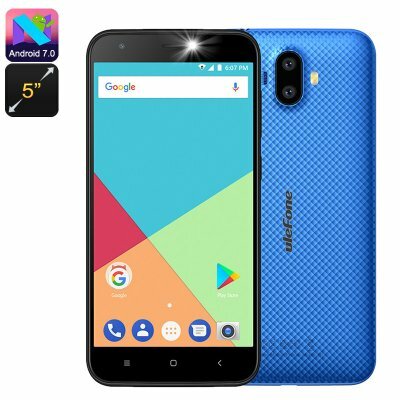 Successfully Added Ulefone S7 Android Smartphone - Quad-Core CPU, Dual-IMEI, Android 7.0, 5-Inch Display, 3G (Blue) to your Shopping Cart. Stay connected anywhere you go with the Ulefone S7 Android smartphone. This cheap Android phone supports two SIM card slots and Dual-IMEI numbers. Thanks to this, you can always be reached on two different phone numbers while using only one cell phone. This makes your Android phone perfect for separating work and private life. It furthermore brings along great convenience for when traveling abroad. Along with its 3G connectivity, this Android smartphone will keep you connected no matter where you’re at. With its Android 7.0 OS, the Ulefone S7 Android smartphone sets forth a smooth user experience. You’ll be able to enjoy all the latest features the smartphone industry has to offer without encountering any lag. Along with its sophisticated Quad-Core processor and 1GB RAM, this Android phone lets you engage in all basic smartphone activities. Whether it’s basic games, movies, or Apps you enjoy – this Android phone handles it all. So simply head out to the Play Store and download the latest media of your liking. With this Android phone at your side, you’ll never be bored again. A beautiful 5-Inch HD display puts forth crisp visuals in 720p resolution. Thanks to this, you’ll always be able to enjoy HD films and games no matter where you’re at. The phone comes with 8GB internal memory and a 128GB SD card slot. Therefore, you won’t have to worry anytime soon about running out of storage for your favorite media and files. Thanks to its whopping 2500mAh battery, you’ll now be able to enjoy your phone’s features throughout the day without needing to recharge. The Ulefone S7 Android Phone comes with a 12 months warranty, brought to you by the leader in electronic devices as well as wholesale Android smartphones..